Dr. Joseph Sebarenzi was born in Rwanda in 1963. He has a bachelor’s degree in sociology, a master’s degree in international and intercultural management, and Ph.D. in law. He specializes in international human rights and in conflict management. Dr. Sebarenzi worked as a high school teacher in Rwanda; worked as an executive in non government organizations in Rwanda, Burundi, and in the Democratic Republic of Congo, and served as speaker of the Rwanda Parliament from 1997 to 2000. As Speaker, he was referred to by many as an independent politician bent on denouncing abuses and enhancing the independence and role of the parliament. Dr. Sebarenzi serves on the faculty of CONTACT at the School for International Training/Graduate institute; speaks about reconciliation, forgiveness, and conflict management at colleges, universities, and events in the United States; and regularly appears and speaks on radio and TV including NPR, BBC and Voice of America. 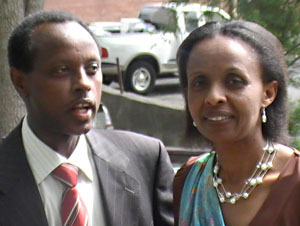 Dr. Sebarenzi and his wife Liberata are blessed with two sons and three daughters. His parents, seven siblings, and most of his close relatives did not survive the genocide in Rwanda. Yet, Sebarenzi instead of being bitter, he strove to live a life of love, compassion, and forgiveness. Dr. Sebarenzi lives in the United States and lectures across the country about reconciliation and conflict management. In God Sleeps in Rwanda: A Journey of Transformation, Dr. Sebarenzi shares his dramatic stories of survival as a child during Rwanda’s tragedies, his daring escape after he learned the plot to assassinate him in 2000; his practical insights on how to resolve and prevent ethnic conflicts; and his wisdom on why individuals should remain positive and kind despite the sufferings they endure. Dr. Sebarenzi maintains that no suffering should derail us from who we are.